This is an original Viking Designer Diamond Sewing and Embroidery Machine. It comes with all the original accessories, hoops, manuals and the optional Dual Feed with the right and left quilt guides. It has many utility, decorative stitches and embroidery designs included. This top of the line machine has been reconditioned, updated and includes our new owners classes. Located at the Alexandria store, or online. 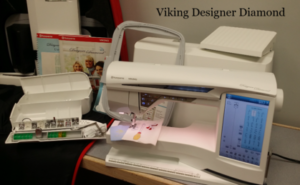 Viking Designer 1: An older top-of-the-line Swedish-made machine that has great exclusive Husqvarna Viking features like the sewing advisor and sensor system. It comes with all of the original presser feet, owners manual, accessories, hard-shell cover, as well as the three original hoops and a bonus 100mm x 170mm “mid hoop” with template. Priced to sell and located at the Alexandria store or online. 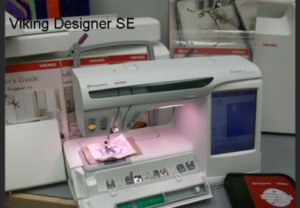 This used and reconditioned Viking Designer SE is a Swedish-made sewing and embroidery machine. It has hundreds of built in utility, decorative stitches and embroidery designs. 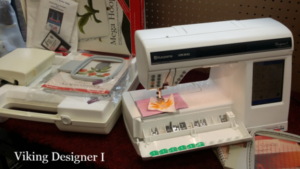 This is a previous top-of-the-line Designer series machine with Vikings exclusive sewing adviser and sensor system. Included are 3 hoops, all accessory feet, cases, owners books and extra designs. Plus a mega hoop. Priced to sell and located at the Alexandria store or online. 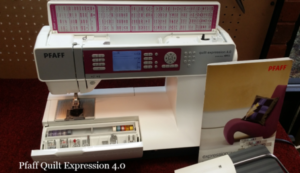 The Pfaff Quilt Expression 4.0 is a large body machine that has 250 mm (10 inches) from the needle to the inside of the harp. It also has the Pfaff original IDT system (dual feed) as well as the automatic presser foot lifter and thread cut feature. With a 9mm stitch width the decorative stitches and alphabets can give your sewing a more impactful look when desired. It includes all of the original presser feet, accessories, knee lifter, hard-shell cover and owners manual.Priced to sell and located at the Alexandria store or online. 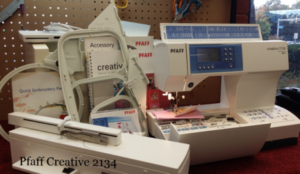 This is a Pfaff Creative 2134 Sewing & Embroidery Machine. It’s a great sewing machine with the Pfaff IDT system (dual feed) as well as hoop-driven embroidery. It comes with all of the original accessories, feet and has 4 embroidery hoops. There is also a standard #300 embroidery smart card, a personal smart card and a smart card station. It is a wonderful machine that adds the element of embroidery. Priced to sell and located at the Alexandria store or online.